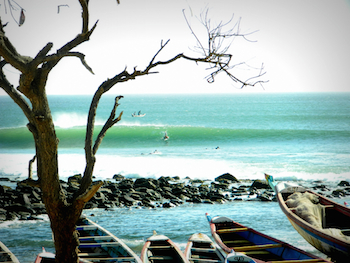 The Malika Surf Camp is located on the north coast of Dakar and offers accommodation, surf lessons, guides, boards and material renting. The Malika Kite Camp is on the south coast, la petite cote, and offers accommodation, kite lessons, SUP and surf services. 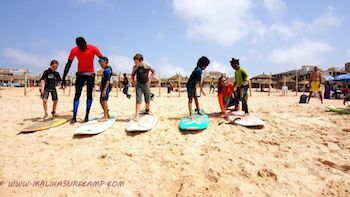 Hello everybody, my name is Marta and I’m the creator of the Malika Surf Camp. When I decided to create this surf camp I received the much needed help of some very good friends; somebody offered me a few wetsuits, somebody a board, somebody a leash or a rash vest. And so I started with 7 boards in 2010. Malika Surf Camp is a 100% local surfcamp, we don’t have any main sponsors but you can now count around 90 boards in our shop on the beach front. Personally, I believe that this is like a circle: if somebody gives me something, I have to give something to somebody else in return. The circle thus continues. So Malika Surf Camp supports local young surfers to live out their dream, same as my friends did with me. If I receive a board, I’ll offer a board. That’s it, simple. 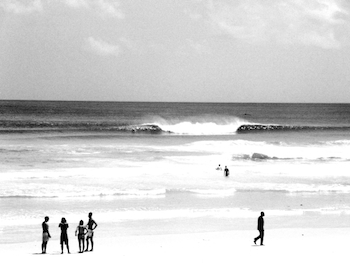 Malika Surf Camp is new concept of surfcamp which combines regulars surf activities with a real contact with locals. We have two locations: the oldest surfhouse (2010) is in Yoff beach, on the North coast of Dakar, while the new surfhouse (2018) is in Tubab Dialaw beach, on the very South coast of Dakar. Both locations offer surf classes and guiding + other sports: yoga and beach-volley in Yoff while yoga, sup and kite in Tubab Dialaw. Tourist visitis are also in the programs. . The main cause in that people are not used to use bins for their trash and we do not have bins, neither in the streets neither in other places like the beaches!! Youngs have no education about it and olds don’t waste their time. Sometimes massive actions of cleaning are taken but not a daily care of the trash. Our position is a bit difficult as people are on holidays and want to enjoy their time. But we act in small things: take a plastic from the beach to a bin, separate plastic bottles from cans or glass at the surf camp, use 10l plastic bottles as rubbish bins. We also put some conteneurs for trash on the empty beach of Tubab Dialaw, to encourage tourists and locals to use them. Because we really would like to be more actives in this area, and we believe that tourists who are aware of the problem can be a very good input for local populations.